Bespoke wooden letters created by You: use our interactive Creative Workshop and choose from a huge selection of fonts, colours and patterns. Create a beautiful decoration for Your children’s room, any area of Your home or business space. Fill it in with lovely rhyme, motivating slogan or personalize with child’s name. Positive emotions are guaranteed! All our production is custom made to order. Thousands of possible combinations so each letter is unique and You are the designer! 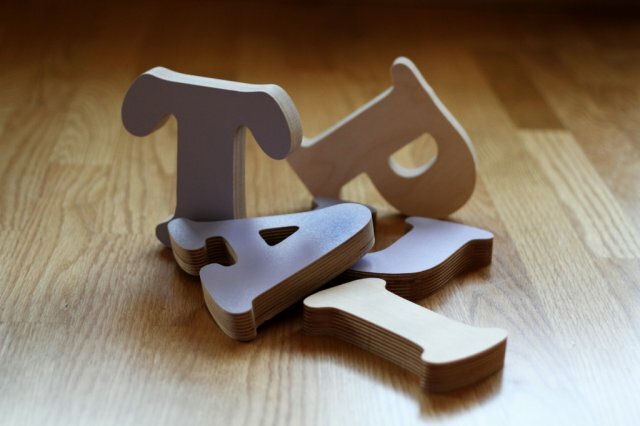 It is not a toy – should You use the wooden letters for decoration purposes. Notice: The letter height you order is based on the uppercase letter "A" of the font you specify. Depending on the font, some uppercase/lowercase letters may be shorter or taller than the height you specify in Creative Workshop so they will look proportionate to each other. If letters are ordered in lower case, we still scale them to an uppercase "A" which will make most of the letters smaller than what was ordered. You can add a sateen ribbon to a letter which will both become a decoration and mounting detail. 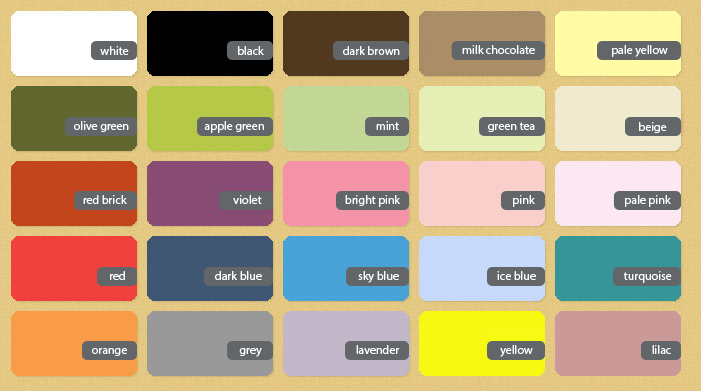 Find the option of ribbon in Creative workshop and specify the colour. Price of ribbon is 1,00 EUR per unit. 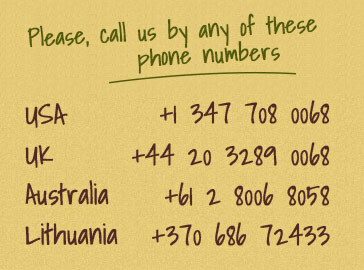 NOTE: 10% discount is applied if 12 or more letters are ordered! 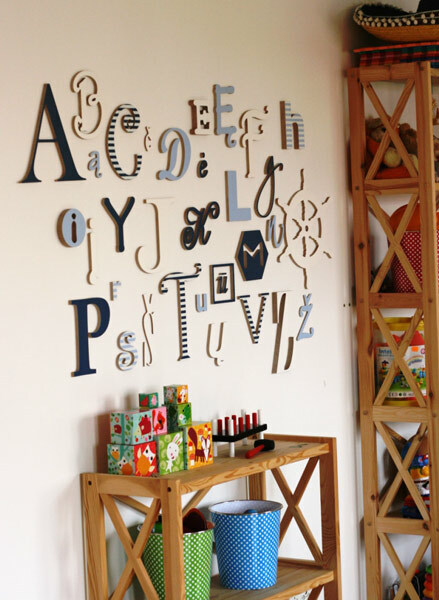 Wall letters are available in 20 different fonts. You can have a look at available fonts here or find them in Creative Workshop. If Your alphabet contains non-latin symbols and You face any trouble by typing it in Creative Workshop please e-mail info@colourfulletters.com and we will solve the problem. Wall letters are available in 25 different colours. You can have a look at available colours here or find them in Creative Workshop. Each wall letter arrives with mounting hardware (double-sided foam tape) and is ready to be attached to any surface. 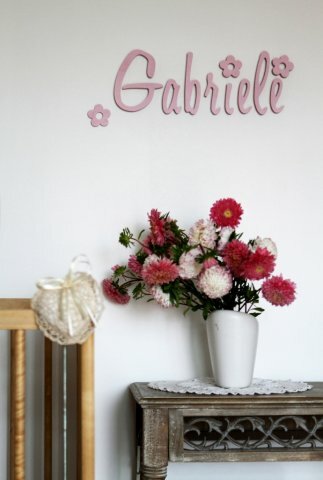 You can add a sateen ribbon to a wall letter which will both become a decoration and mounting detail. Find the option of ribbon in Creative workshop and specify the colour. 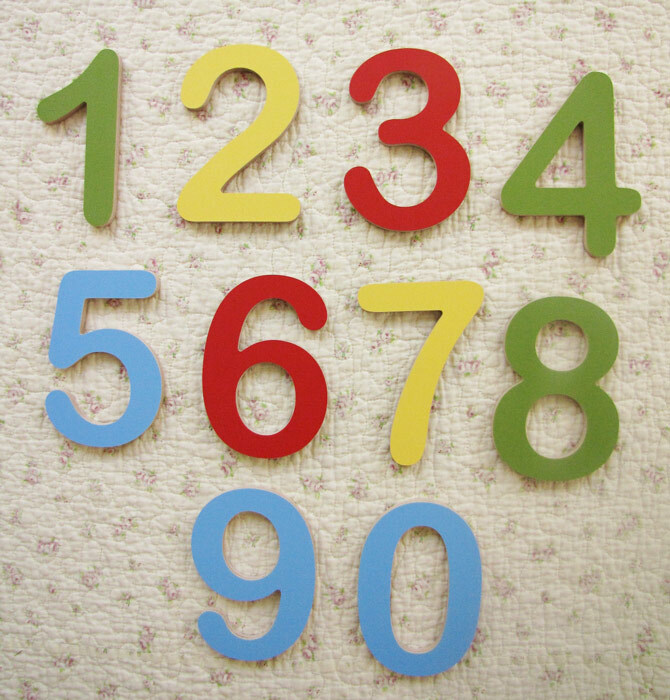 Considering the risk of objects falling down we do not recommend attaching letters directly above the crib or child’s bed. All our production is custom made to order. Each letter is unique – so please allow 10 business days (appr. 2 weeks) production/dispatch time. If You have any important due dates please contact us info@colourfulletters.com and we will certainly try to meet Your deadlines. Free-standing letters are cut from 24 mm (1 inch) Baltic Birch Plywood. 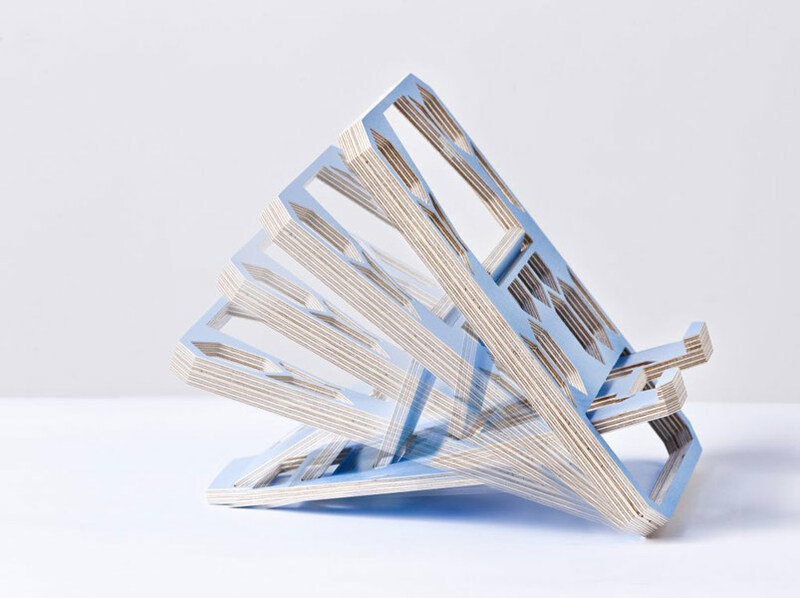 Plywood is made by adding thin layers of natural timber to one piece. Its emission class is E1, it is safe for You and Your children. We use indoor-rated matte water base paint on the face and back of decorated free-standing letters. Edges are not painted. You can see a striped pattern of timber layers on the edges which gives such a modern look! You can choose either unpainted, plain colour or patterned letters. Only one side (face) of free-standing letters are decorated (back side painted in plain colour) so it can be displayed in any open area, e.g. table, shelf or windowsill. Height options: 15 cm (6 inch), 25cm (10 inch). Need different size? E-mail us info@colourfulletters.com - we are able to make any height from 5 cm (2 inch) up to 60 cm (24 inch). The vast majority of free-standing letters don’t need any additional mounting hardware, anyhow please pay attention that some of them (e.g. y, p, q) often can’t free-stand. Price of a free-standing letter depends on its size and painting options. NOTE: both sides of free-standing letters are decorated. Free-standing letters are available in 11 different fonts. If You want a different font to be used for Your letters please contact us and we will try to implement any of Your requests at no fee. 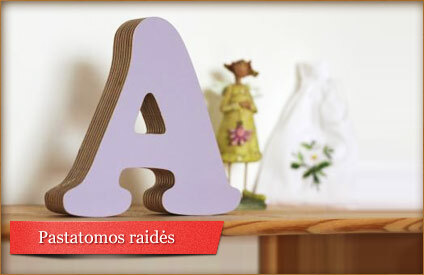 Free-standing letters are available in 25 different colours. Browse among thousands of pattern combinations in our Colour Pallete gallery. If You can’t find the pattern colour combination You desire please leave a comment when making an order or contact us by email info@colourfulletters.com – we can fulfill any request at no fee. The vast majority of free-standing letters don’t need any additional mounting hardware, anyhow please pay attention that some of them (e.g. y, p, q) can’t free-stand. NOTE: Only one side (face) of free-standing letters are decorated (back side painted in plain colour) so it can be displayed in any open area, e.g. table, shelf or windowsill. Our special products in this section are initially created for our personal use - approved and recommended for You. And they are Ready-to-go! When ordering You don't have to wait for additional 2 weeks production time, so please review our list (we keep updating it from time to time, so please check once in a while!). 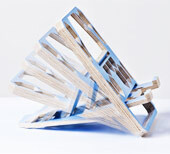 Ready-to-go products include various goods - from wooden alphabet sets to ergonomic laptop stand - made of wood, of course! Can't You choose a gift? Give a joy of creation! Certificate will be valid for 12 months from purchase date.